Featured as Belgian artist of the moment in DJ Mag Belgium Issue. Premiered on Majestic Casual Youtube Channel with over 200 000 Plays in 1 week. Mixmag: 'With Florida singer Marques Toliver's smooth as silk vocals weaving in and out, Compuphonic's layering of sprightly pads and deft snares make for yet another super lush house cut.' Early support by BBC Radio 1/Danny Howard, Laurent Garnier, Robag Wruhme, DJ T, Tensnake, The Magician, Miguel Campbell, Karotte, Arthur Baker, Adana Twins, Agoria, Doctor Dru, Peter Kruder, Mickey, Kartell, Ruede Hagelstein, Lane 8 and many more. Instrumentals and Radio Edits upon request: mail to info@exploitedghetto.de or leave feedback in comments if you require so. 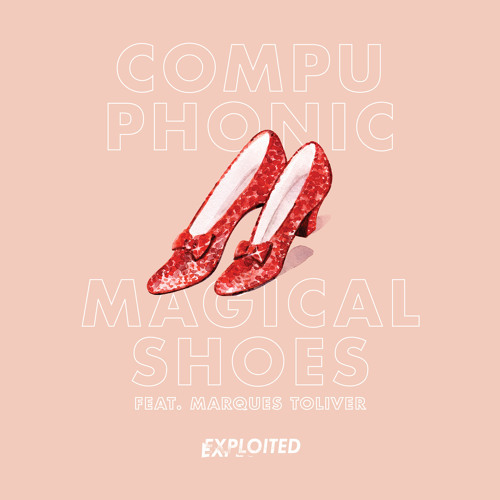 Pre-Order ITunes: http://bit.ly/CompuphonicMagicalShoes With over 7 million plays and counting on YouTube Compuphonic's 2011 collaboration with Marques Toliver, 'Sunset' raised the bar pretty high. Since then Maxime has gone on to produce remixes for the likes of Giorgio Moroder, Gotye even and fellow Belgians The Subs (winning a Red Bull award in the process) and release two acclaimed EPs on Berlin label Exploited. Now finally Maxime and Marques have reunited for a new EP on Exploited, 'Magical Shoes', and the results are everything we could have hoped for. Having delivered two huge club hits in 2014 with ’Radio Atlantis’ and ’O Cypres’, Belgian star Compuphonic returns this February with his third EP for Exploited, ‘Magical Shoes’. 2 tracks of sublime House music, the ‘Magical Shoes’ EP sees Compuphonic finally reunited with the Beyoncé approved American singer Marques Toliver, whose vocals previously graced Maxime’s 2012 breakout hit ’Sunset’. Once again this Transatlantic pairing have struck gold as Compuphonic’s distinctive brand of deeply emotional, nuanced, House Music provides the perfect setting for Marques’ plaintive vocals. With it’s distinctive Korg M1 organ and shuffling beats ‘Magical Shoes’ instantly brings to mind legendary ‘90s New York clubs like The Sound Factory but thanks to Compuphonic’s production skills it goes well beyond that of simple period pastiche and sounds utterly fresh for 2015, a bonafide club hit that is already peppering the sets of DJs such as Laurent Garnier, Tensnake and The Magician. As the title suggests the EP’s 2nd track ‘The Sun Does Rise’ is the natural successor to the duo’s previous outing. As deep as the Pacific Ocean this is a trance inducing hymn to hope, music designed to elevate the soul as much as move the body and bring some much needed warmth back to clubland. Expect to hear this played everywhere and anywhere this year where the party goes through the night and the first morning light breaks over the dancefloor. Recorded in the famous Vantage Point Studios in Antwerp - dEUS’s own recording studio, a special, inspiring moment for Maxime, a lifelong fan of the band - the ‘Magical Shoes’ EP cements his position as one of Europe’s most talented producers and with remixes to come soon on Carl Craig’s Planet E and more original material on Exploited, the future is looking bright for Compuphonic. Artist: Compuphonic Release: Magical Shoes Label: Exploited Release date Beatport: 09.02.15 Release date iTunes, etc: 23.02.15 Art Design by Neven Cvijanovic / Floor 5. Illustration by Laura Junger. www.nevenswork.com www.loragearrive.free.fr Early Feedback: Robag Wruhme: Will test it loud. The Magician: Magical Shoes fit to my feet! More seriously, its very good and I’ll play it. Miguel Campbell: Cool EP. I will support. Kasper Bjoerke: Epic vibe on The Sun Does Rise. Thanks! Arthur Baker: Feeling the Sun Does Rise. Laurent Garnier: Magical Shoes: Ohhh yesssss. Danny Howard: Very nice!!! Tensnake: Magical Shoes is sweet. Adana Twins: The Sun Does Rise is nice! Thank you. Pezzner: Truly brilliant work.